Albeit, he may be wrong about his perception of IPOB under the able leadership of Mazi Nnamdi Kanu as an organization of people or group of Biafrans, but Evangelist JOSEPH AGBO, the visionary of the Pot of Oil Ministry, as he calls it, and a lecturer of philosophy at the Ebonyi State University, EBSU, Abakaliki, is one person who cannot be waived or shoved aside when it comes to history and all the nitty-gritty of the foundation of Nigeria and even that of the western world. In this exclusive, yet very interesting and educative interview conducted at Urban Radio’s studio Enugu, on the program ‘Urban Parliament’ and supervised by CHUKWUEMEKA CHIMERUE of Biafra Writers, Evang. Agbo went down memory lane, telling us about how he thinks it all started, how we found ourselves into this mess and the circumstances surrounding the emergence and rise of IPOB on the path to reclaiming their pride and nation, Biafra, which according to him, is a very big ‘Ijele’ masquerade that existed many years ago before the amalgamation that brought us where we are today. The resource person in the studio who spoke on the topic, “IPOB and Federal government,”also faulted the foundational structure of Nigeria as a sovereign entity, the illegal arrest and continued detention of the IPOB leader, Nnamdi Kanu which he described as a very big mistake and then proffered solutions on how best to tackle these problems through first and foremost, he said, is the release of the IPOB leader, dialogue and eventually referendum, amongst other things, insisting that you cannot hold a people for too long against their wish. RELATED POST: BIAFRA: THE SPIRIT OF BIAFRA WILL HOVER FROM THE BEGINNING TO THE ENDS OF THE EARTH ON 23RD SEPT...IPOB ARE YOU READY? up from the IPOB, TRIPOB, and the other one; RENIPOB or so. So, with all these, can you give us a history from the start of how we get to where we are today? Thank you. Well, I think the issues are quite... I would like to make a distinction here, the distinction between the IPOB that is an organization, that is a group and then the IPOB that is a people, there is a group that emerged a couple of years ago by that name being led by Nnamdi Kanu and of course, there is also the Indigenous People of Biafra as a people, as a place, so we’re going to look at this matter from both angles because there are people called the Indigenous Peoples of Biafra and there’s an organization called Indigenous People of Biafra, that is known simply as IPOB. And so, IPOB emerged... I think it’s certain from... I want to state clearly that am not a card carrying member of IPOB; the organization but I am from the people, you know, the indigenous people of Biafra. I live in that territory which had existed 500 years before Nigeria came into existence in 1914. In the Portuguese map of 1492 that is produced, the map of Africa, there’s a vast area named Biafra in that map. And it’s right there in the archives for those who cares about history. And the question you’ve asked is that how did we get here, how did we get to the point where a man is locked up for over a year now and there is going back and forth, the judiciary appears to be confused about what to do about him, today they grant him bail, tomorrow they rearrest him, you know, all manner of legal acrobatics have being going on and then how did we get here... We got here because there’s a lot of injustices in the land. I have always said that Nigeria is the only country that places peace before justice. You know, the last part of the second stanza of the Nigerian anthem says “we want to build a nation where peace and justice shall reign.” But you know you can never have it the other way round. If you want peace, you must have justice, so you can’t put the cart before the horse. So a lot of injustices within the land and I want to first of all state that Nigeria came into existence as a federation. The founding fathers of Nigeria took about 10 years, 1950 to 1960, fashioning out a federal constitution because the peoples within the territory called Nigeria are so diverse; culturally diverse, religiously diverse, traditionally diverse, linguistically diverse, and what have you. And then they said, look, if we have to really stay together, then we must fashion out a federation that looks like that of the United States. You know, in the United States, it’s difficult sometimes... I was saying the other day, I don’t know whether there’s somebody called an American-America in America. It’s either you’re an African-America or a European-American, a black-American, you know, all those kinds of things like German-America, a Jewish-America, etc. And they said, look, if we must co-exist, because, in fact, most of the States in Africa, practically all the States in Africa came as a result of the Berlin Conference of 1884, 85, and so the conditions and circumstances that were necessary for the emergence of the modern nation-States did not exist in Africa when these States came into existence, they were just shared out like cakes. You know Achebe said that they were shared out like “pieces of chocolate in a birthday party,” and Britain got the territory that is known today as Nigeria. And they said okay no problem, if it was a problem if our marriage was forced or done without our consent, can we do something about it? And so the leaders of Nigeria started doing something about it from 1950, you remember the Macpherson Constitution of 1951, the Lyttleton Constitution in 1954 up to the independence constitution of 1960. They fashioned a federal constitution, by 1960, Nigeria actually had four different constitutions; one federal constitution and three regional constitutions because these regions now constituted a federating unit. And the then Prime Minister Tafawa Balewa appointed Edward Longe, a Briton, to supervise a referendum. And that referendum held on 13th July 1963, an overwhelming 89 percent voted ‘Yes’ and after that vote, they took it to the National Assembly and the Midwestern region was created. You know, a lot of things happened which we may require a day or more to begin to analyze, you know, between that 1960 to 1966 when the coup that took place and all the other issues that happened that now led to the war of 1967 to 1970. During that war, Gowon promulgated a petroleum decree of 1969 which changed the derivation formula of revenue to allocation and I think that’s where the problem began. The center, Nigeria, now became a centralized state because when Aguiyi Ironsi passed promulgated decree Number 34 on 24th of May, 1966 to unify Nigeria in the line with military structure, all the regions especially the North, protested, they said, look we are a federation, let the regions stand the way they are but Aguiyi Ironsi said, “let us have a united Nigeria,” but they said ‘No’ and the response was five days later, 29th May. When the pogrom began and so by the time Gowon passed out in 1969, everything else changed and then all the resources that belong to each of the regions now became owned by the Federal government. I think that’s where all these problems began and we now began to have overtime, systemic injustices. Over time, people who are supposed to own their thing (resources), they now became Federal government own and then created a structure whereby every month people goes to Abuja and collects money after 30 days and when they comes back, they share it with their brothers and Nigerians had never really made a constitution and that’s part of the problem because the constitution we use to give governors and president so much power that it becomes very difficult for resources to trickle down to the people who need these resources. Okay, let’s fast-forward also to today, tell us about how IPOB as a group started, at least, the much that you know, you’ve earlier stated that you’re not a member of IPOB, but can you tell us a little bit about how it started and what led to it being formed in the first place? Now, in 2007, the United Nations passed a resolution, that resolution was called “The Rights of the Indigenous Peoples” of the world to determine their destiny, it’s UN resolution 2007, you can check it out. I can’t remember exactly the year IPOB came into existence but am sure it’s not more than five years and then it’s as a result of some of the issues and challenges that MASSOB had. They said, look, MASSOB appears to be operating like an exclusive group, so let us have a group that would really belong to the indigenous peoples of Biafra no matter where you are because the original Biafra that was announced on May 30th, 1967, of course, included those in Delta, those in what we call today South-South, you know, the East central/Eastern region of that time which includes today’s Rivers state, Akwa Ibom, Bayelsa and Cross rivers as well. 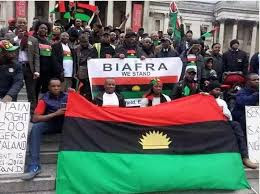 And so the IPOB essentially emerged in order to insist on that right which the United Nations had granted every indigenous people of the world. decide and it’s a right which the United Nations had granted and which also the United Nations in their wisdom, knew that this is a natural right. Am an evangelist, if you read Genesis chapter 1 from verse 26, where God said “let us make man in our own image and let us have dominion over...” if you read it down it says “over the fishes of the sea, over the birds of the air, over the animals in the field,” but you didn’t see “have dominion over man on earth, No.” A man is not designed to have dominion over another man, you can have dominion over animals, over birds, over some parts of nature, but you cannot have dominion over another man, so if you try to dominate man for too long, it won’t last. The Soviet Union came into existence by fort in 1917 when Vladimir Lenin came secretly back from exile in Switzerland and hijacked a meeting in Moscow; a meeting of all people’s Soviet and what they did was to promulgate a lot of decrees and within one month, a flood of decrees formed the Soviet Union and in 1940, Latvia, Estonia and Lithuania were forced into the Union and that's the Soviet Union; the largest country in the world, existed for 72 years and when Mikhail Gorbachev came, he said, this country is existing fraudulently, it’s existing in deception. A lot of things were being hidden, they didn’t want people to know that there’s a serious crisis rocking, hunger in the Soviet Union, so he said, look, I want to do glasnost and perestroika(This is a kind of a reform introduced by Gorbachev which eventually spiraled out of control and led the Soviet Union to collapse), which is restructuring and openness, he wants to open the society. And by the time he opened the society and people saw the decay, people said it was an agency thing that broke up the Soviet Union, no, you can’t break up a people except they’re willing to break themselves, otherwise it’s not cheap. So when you package a falsehood, something you don’t want to give a foundation, the thing is bound to have a problem and the Soviet Union had that problem, Czechoslovakia had the same problem, Yugoslavia had the same problem and so IPOB said “we want to determine our own destiny, we have the right to determine our own destiny, we are Biafrans and if we are going to be part of Nigeria, why don’t you allow us to vote, there’s a referendum, a referendum which created the Midwestern region, so why can’t we allow the same referendum now? It was a referendum that created South Sudan, a referendum pulled Britain out of the EU and this is 2016, so why are we having the double standard?” You apply some rules in some places and you don’t apply some rules in some other places. I heard somebody speaking on CNN the other day and he was saying..., as a matter of fact, some people came from the part of American House of Representatives, they met us this year, they met some of the organizations that I belong to, not IPOB, they came and said, look, this thing that is spreading all over the world about IPOB... so they came to find out and we told them our own side of the story. So that was what led to the IPOB and they said look, we can’t take up arms, we want to be nonviolent, we want to ask for our right, just like Martin Luther used to do those days in the early 60s in the United States, when he finished preaching, he mobilized Americans... and it’s that right that he demanded in late 50s and early 60s that led to a black man sitting today at the revered office of the President of the United States of America, so that’s basically what IPOB wanted and of course, just like I said in one other program, it’s like the Biafrans are like the Jews that were in Egypt in slavery, so each time they demand to leave, Pharaoh will say ‘No,’ otherwise, it shouldn’t be a problem that somebody said, I want to build my house on the right side and another person said my own house will be built on the left side, so why should there be a problem with it? Why do you think that the Federal government has decided to ignore the UN Resolution that gives indigenous peoples the right to self-determination or decide to be on their own and the second question is, do you believe that the whole of Igbo people wants to be on their own, or is it just a faction? I mean, do you believe that every Igbo man or woman is wanting to also belong to this new entity called Biafra or is it just a faction? Well, I think, there are two reasons, number one is economic, the other one appears to be religious, I may be wrong, but I have been in this struggle, studying it since 1993 after the annulment of the June 12 election with Anthony Enahoro and some other people who had asked for... We belonged to a movement then known as “Movement for New Nigeria,” and we’ve looked at the future, we’ve looked at the situations and said look when a house has a foundational issue, you don’t need to patch it and begin to paint it. zinc and useful wood and pack them very well and then do a bricklayer’s job and re-lay a foundation and build again, that’s what we were saying that time in Movement for New Nigeria. We said look, Nigeria appears to be collapsing and so there’s an economic path, I know from my studies, Nigeria has up to 606 oil wells. We’re exploiting about 95 oil wells and some two, three years ago, Senator Ita Enang stood on the floor of the Senate and said that 83.5 percent of Nigeria’s oil wells are in the hands of the North-West and this is the mainstay of Nigeria’s economy. I also remember in 1944 when the West Africa student’s union came to the North and asked them to support a Constitutional reform so that Nigeria will have independence, and a united Nigeria, you know, all those kinds of talks. So they issued a communiqué and it read in part, “Holding this country together is not possible except by the religion of the prophet, if they want political unity, let them accept our religion.” Now, I was also listening to one Mallam sometimes ago, I think it was on this station and he was saying that when a Fulani man moves, he moves with his cattle and his religion if I heard him very well. Now I think there’s a religious angle in all of this. There is an allegation that there’s a plan to Islamize the whole country and so if you let this person be, two things will happen, one, the 83 point something percent of the oil wells that they have, they have to lose it naturally, two, the people that they may want to Islamize may now want to stand on their own because I remember the popular statement made by Uthman Dan Fodio; that he’s going to run with the Qur'an until he dumps it in the Atlantic. Now, if you put these two statements made by Bello and Dan-Fodio together, I don’t see any other reason why somebody... Like if you put me in this studio, I didn’t enter this studio by force, right? I entered on my own, and if I say I want to go and you said no, I can’t go and that I must keep talking here, until the year 3000, well, I’ll attempt to see whether I can talk until the year 3000 but of course, somewhere along the line, am going to break down and I’ll pretend as if everything is alright but I’ll be beating to see whether I can see a razor blade, if I get that razor blade, I’ll be using it to cut these walls (pointing at the studio walls) gradually to see whether I can open up a place of escape, that’s what has happened. Staying together is not compulsory... For example, if you say we must stay together, then let’s come to the table, what do I bring to the table, what do I take out of the table, and that’s what people who talk about restructuring, I have a problem with it. I said, one-quarter of me belongs to restructuring and three-quarters belongs to the other side which is “to your tents oh! Israel” why did I give one-quarter a chance? It's because, if you want to restructure, they won’t allow you. If you restructure and it’s not fiscally, you know, you generate your own resources and pay tax to the center, if they won’t allow you, then what are you restructuring? It’s not like creating another lame state in the Southeast that you now so it’s restructuring. Are going to remove other zones that have seven and bring it to the Southeast or are you still going to leave that one at seven? Are you still going to leave states like Kano at 44 local governments and Lagos with 20, with the same population? Kano and Jigawa have 71 local governments, the whole local governments in the Southeast is 95. So what type of restructuring are they talking about? Are you going to let it happen? So these are the reasons why restructuring tends not to work...you know, some 20 years ago, I had written an academic article and I suggested that Nigeria should go off oil exploration for 30 years, that we are producing lazy leadership, leaders who just wait for 30 days and they’ll go and collect money and share it with their brothers. Just like Lord Lewis Vernon Harcourt; the one whose name we named after Port Harcourt said in 1913 that “we’ve found a southern lady of means(referring to the Southern Nigeria), that is going to get married to the North.”He said that he wished that the union will prosper and that it would release the British government from the treasury-- the money they’re spending on the treasury. And so the South appears to be “the Southern lady of means married to the North,” and to let them go is like letting the Israelites go from Egypt. ...No, from me, personally, I think that there’s an overwhelming... We’ll even have more than the 89 percent that voted to create the Mid-Western region, I tell you, we’ll have more than 89 percent because of a referendum... That’s why in the Mid-Western referendum, it was announced in February and the referendum took place 5 months later which was on July 13th, 1963, so 5 months was given to sensitize the people. So if you give us one month to sensitize the Igbos, please allow me to speak for the Igbos as an example, about whether they prefer freedom or whether they want to be president of Nigeria, am sure they’ll vote 90 percent, that they want to be free on their own if the Nigerian state won’t allow them to express themselves. I have always asked this question, have Nigeria asked how Biafrans survived for 3 and half years in spite of the blockage, why is it that they have refused to tap the grease that these people(Biafrans) used? They could have used it to change the entire Nigeria and rid the entire Africa but I think the Soviet Union that time said they didn’t want another Japan in Africa. Now, in your own terms or opinion, do you think the federal government is handling the case of Nnamdi Kanu well enough? They’re not even handling it well,... you’re talking about well enough, they’re not handling it well at all because it is difficult to find out, you know, they’re just accusing him, they’re mostly trumped up charges, if you look at it very closely, they’re trumped up charges and somethings beats my imagination, you don’t call an American president and he begins to tell you about one man, one terrorist, assuming it’s even a terrorist that was arrested, he will not be able to discuss it, he’ll tell you to go and meet the legal authorities. The way the president, Muhammadu Buhari use to talk about it as if he’s the one that really went to arrest him and that the young man(Nnamdi Kanu) is locked behind his house or room, you know, it leaves much to be desired, so that if you don’t suspect something, you’ll be forced to begin to suspect that there is some kind of foul play going on somewhere. And where do you feel that they’ve got it all wrong? Well, they said the man... They’ve accused him of all kinds of things which they have not been able to prove. Once in a while the courts have actually granted him bail and he was rearrested and that’s one place they got it wrong. And you keep seeing judges washing their hands off, it’s like they’re afraid, people are afraid, you know, the word ‘Biafra’ number one, is a big ‘Ijele’ masquerade, people just don’t want to face it and two, Nnamdi Kanu appears to be a very courageous young man. You know, the way you operate may not be the way I operate, some people. Some people may be very brazenly, while some people may be more diplomatic but you know, I think the young man must have used too much diplomacy and it appears not to be working so he... So they got it wrong by not allowing the court to decide his fate. Because when Nnamdi Kanu was arrested, the first person that tweeted was Vladimir Putin, the Russian president and so on, they called him a self-determination activist, that’s huge if you ask me. For the Russian president to say that Nnamdi Kanu is a self-determination activist, it means the world is watching and I don’t think that arresting a man... Maybe if you arrest him, you’ll say he is running an illegal radio, the radio station is not located in Nigeria, you arrest him for abusing people, well, you charge him for libel or something, I don’t know but libel is not enough to lock someone for this long, that’s where I think it’s wrong about it and everyone now knows that it’s because he’s talking about Biafra that it’s like that. I’ve been talking about Biafra before Nnamdi Kanu, so I don’t know what the young man has done specifically. They’re too many other people who are talking about Biafra, if you begin to arrest all of us, they’ll probably not be enough jail or prison in the whole world to accommodate us because they’re hundred million Igbo people scattered all over the world. So what next, I mean, what do you feel is the way forward? Simple, two things basically, let the young man be released from detention because right now he’s not a prisoner and he’s not directly or exactly facing trial. Release the young man and IPOB people appears to be waiting, you know, they have killed so many of them and they’re not afraid to die again because they said since we have the only flag, we have only our hand, we’re just holding the Bible, and they’re shooting us, they can go ahead. The blood of the innocent people uses to speak from the group so we don’t want people to be shot or killed anymore. So let them release the young man. So was that the main focus of the National Conference? ...What am trying to find out is when the idea of setting up a National conference and pulling people together from all over Nigeria; scholars, professors, past governors and all that, you know, was it because then President Jonathan wanted to figure out or wanted to understand about the amalgamation and the Charter, and the things you’re talking about now or were there other reasons behind setting up the conference and then are these one of the things that were talked about? You know, some of our lieutenants, some of our partners went to British medium and they formed an amalgamation document and it is stated clearly in that document that it’s for the first hundred years. So, Jonathan appears to be aware of it, I don’t know, but I believe he knew about it because if you look at the speed with which the preparation for the conference was going, you didn’t need to take too many years to prepare for it because he was aware of the public opinion, things that were being said in the media, he knew that technically, Nigeria ceased on December 31st, 2013, so he wanted us to sit down and said okay, let us draw a new Charter of existence, of relationship, and some people didn’t want it, they said there should be a ‘no-go-area’ you know, what led me to this was, he was asking me what do we do, I said, we need to dialogue and in that dialogue there should be no ‘no-go-area’, they shouldn’t create a ‘no-go-area’. When people say Nigeria’s unity is non-negotiable; you’re saying technically that Nigeria’s unity is not unity, that’s the implication. Go to the dictionary, check the word “unity” and check the word “negotiate”. If Nigeria’s unity is non-negotiable, it means they’re saying that Nigeria’s unity is not to be agreed upon, it’s actually to be disagreed upon. It’s simply a paradox! When our leaders make that statement, they make it without thinking what they’re saying. You’re saying that we should unite and you’re saying that we should not unite. Some people in the South-South has been rumored to have excluded themselves from the Biafran nation, I mean, we have a particular ethnic group in Rivers state, the Ogonis, who had actually agitated for a separate entity. What do you have to say about this, how can this be handled? You see, I was addressing some people on this issue some two weeks ago and I was saying, look, there’s this false impression that the Southeast actually needs the South-South to survive and that is why we keep bringing them into the Biafran discussion but it’s not true. The reason actually is that the South-South are originally part of Biafra, so it is left for them to withdraw. For example, the leader of the Bilie Human Rights Initiatives (Bilie is Biafran Liberation in Exile), is from Akwa Ibom state, so it’s not true that... Just like you find some people here who may not agree with the Biafran cause even in the Southeast here, that is the same way you find some people in the South-South who do not agree. So it’s not really or exactly the truth. Either in the old Biafra of 1967 to 70 or in the current situation, there are people... I went to Port Harcourt the other day and I discovered that a lot of people, even in the buses, are discussing Biafra and they are not as it were, Igbos, you understand? And so it’s just some people, you know, there was a day I was on radio again and somebody was protesting and said, look, we should not include them in Biafra, I think the person was calling from Cross-rivers or Akwa Ibom and another person called from Delta or was it from Edo state and said look, that the Igbos should not be talking as if they are the only ones who owns Biafra, that they are also part of it. And I said okay, you see now the problem! So that’s why a referendum will solve the problem. That’s why I keep saying, give people the chance to vote when they vote, they’ll decide what they want. Evang. Agbo, so what are your final words, Sir? I think I’ll conclude by saying that there’s no point holding a people, a human being cannot be held by force. If you must exist together, it must be in agreement. In 2015, Obama said he’s going to admit Syrian refugees to America. In 48 hours, 13 states told Obama “no problem, admit Syrian refugees to America, the only problem is that they won’t come to our states.” Why? Because it’s a federation, they formed the United States, the United States didn’t form them. So, we should re-federate, if we don’t re-federate, if we don’t restructure..., am talking both as a man of God and as a prognostic social scientist who has studied the situation. This ship; the Nigerian ship seriously is rocking, from the North to the West to the East and to the South, everywhere is rocking, even Abuja is rocking. Why? We have refused to talk as if it is human beings we are dealing with. We’re making it look as if we are shapeless amoebas. It is not so, human beings cannot be held against their will for too long. ...Thank you very much, Sir, for having a time with us.